Replacement Seat and Belt - Largest Twin Store & Twin Gift Registry! Feeding table replacement seat with belt. 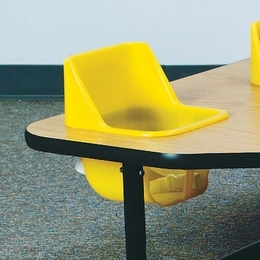 These removable easy-to-clean seats fit the feeding and activity tables. Price is for one seat and belt. Suitable for children 5 - 24+ months. Weight limit: 30 pounds per seat. Due to size restrictions and cost, we ship this product within the domestic UNITED STATES only.